Enraged farmers blocked the Sambra road this morning after their only road which was built a couple of months back has been washed away in the recent rains. This was a road constructed besides the security wall of the Sambra airport so that the farmers can access their farm lands. Earlier the farmers had a road which now is part of the Runway. 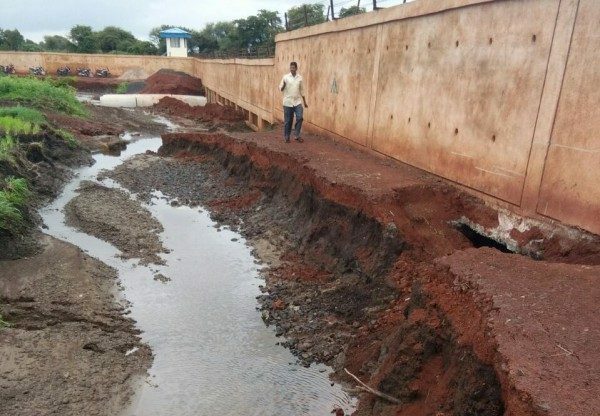 Approximately Rs.72 lakhs were spent on the 4 kms stretch of road which has been washed away in a single rain the farmers complain. This is peak time for farmers to sow and do other allied works on the farm land and with only one road to the fields which has been washed away the farmers were highly enraged at the callous attitude of the district administration. The said road was also constructed after various rounds of protests by the farmers earlier. ADC Suresh Itnal paid a visit to the spot.